Your One-Stop Shop for Dental Implants! Patients who need to replace anything from a single tooth to a full row of teeth can achieve beautiful, natural-looking results with dental implants. But the benefits of dental implants don’t stop with their appearance. This revolutionary restorative service mimics the natural crown-and-root structure of teeth. As a result, implant-supported restorations provide patients with greater stability than traditional prosthetics. Imagine yourself smiling with a newfound sense of confidence and enjoying foods you previously couldn’t with traditional dentures. Board certified prosthodontist, Dr. Schumacher, can help you do both with dental implants. Many general dentists offering implant dentistry send patients to a specialist for the first phase of care. As a board certified prosthodontist with advanced training and expertise, Dr. Schumacher offers top of the line implant dentistry at his Wakefield dental office and can help you understand what treatment options are available. During the first phase of treatment, one or more metal implant posts are surgically placed in the patient’s mouth. A single implant stabilizes a single crown while multiple implants stabilize a partial or full denture. Following surgery, your mouth needs time to heal. As it does, the jawbone and implant(s) form a natural bond in a process known as osseointegration. This bond between your implant(s) and jaw is what enables implant patients to enjoy such natural results. Once the osseointegration process is complete, you’ll return to our Wakefield dental office to have your custom-made prosthetic attached. This phase of care is known as the restoration phase. Once it’s complete, you can look forward to enjoying a beautiful new smile for years to come. Any patient considering dental implants should schedule a consultation with Dr. Schumacher to learn more about the treatment process. Not every patient is a good candidate for implants, and an oral exam helps us understand if this service is the right solution for you. If it is, our Wakefield dental team begins working on a treatment plan immediately. If it’s not, we explore alternative solutions with you during that same appointment. Regardless of the service we recommend, Dr. Schumacher uses his expertise as a prosthodontist to help you achieve functional and beautiful results. Dental implants are widely known for their durability, longevity and reliability. According to clinical studies, dental implants have been proven to carry an average success rate as high as 98 percent over a 10-year period. As long as you practice regular oral care and discontinue the use of all tobacco products, there are very few reasons why your implants would not last anywhere from 25 years to a lifetime. Furthermore, no other tooth replacement option provides the same level of aesthetics as dental implants. By reestablishing blood flow, your face and your cheeks will not prematurely sag or appear hollow, which is a common side effect of tooth loss. Because a titanium post is anchoring your tooth, there’s no need to cut down existing tooth structure just so it can hold a restoration. By the time your implant has fully healed, it will feel as natural as the rest of your teeth, whether you’re chewing, speaking, brushing, flossing or smiling for a group photo. As mentioned, there are many ways to replace teeth via implants. Take a moment to consider how Dr. Schumacher makes it happen! As previously mentioned, a single implant will provide a stable foundation for a single crown. An abutment attaches the crown and implant together, further ensuring that your restoration maintains stability through daily use. The crown is made from porcelain due to it’s incredibly lifelike properties, both in appearance and function. While the porcelain crown cannot develop decay like natural enamel, you will still need to practice regular oral hygiene to prevent plaque buildup and gum disease. 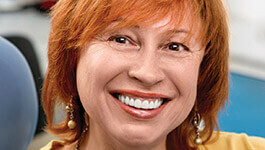 Replacing multiple teeth with dental implants is quite similar to traditional bridges. However, instead of shaving down two teeth so they can hold a bridge, two implants hold a restoration of three to four teeth at a time. The beauty of replacing teeth in this way is that you don’t necessarily need the same amount of implants to replace the same amount of teeth. Patients missing numerous teeth or a full arch of teeth have depended on removable partial and full dentures for years, but these solutions offer minimal restoration of dental function. Implant-retained dentures provide additional support for more natural appearance and function. Patients may choose either removable or fixed implant supported dental prosthetics, and with Dr. Schumacher’s years of training and experience as a board certified prosthodontist, patients are certain to receive only the most comfortable, durable, and beautiful restoration. Patients with congenitally missing teeth or who lose teeth due to trauma may also wish to consider implant supported tooth replacement. These replacement teeth most closely resemble natural dental structure replacing the roots and biting surfaces of teeth making implant supported replacement teeth the ideal solution for those who do not develop certain teeth naturally due to genetic flaws. Patients who experience facial trauma leading to tooth loss are typically good candidates for implant supported tooth replacement since they have not had to deal with diminished jawbone density following tooth loss. If you wanted to know your cost for dental implants upfront, it’s important that you understand that determining cost is not always so cut-and-dry. The total cost of your implants will vary depending on several different factors, such as the number of implants being placed, the type of restoration you need and any preparatory treatments necessary to make dental implants possible. Keep in mind that dental implants are a long-term solution for tooth loss, unlike all other replacement options. The upfront cost may be high, but it’s still cheaper in the long-term compared to regularly replacing bridges and dentures every several years.